Kaikai Kiki Gallery is excited to announce that it will be holding a talkshow featuring Madsaki, the artist of our current solo exhibition, “Here Today, Gone Tomorrow.” Guest speakers will be Kaikai Kiki’s graffiti specialist Takumi Kaseno and street culture expert Hiroshi Egaitsu. 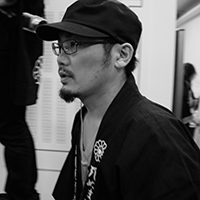 Editorial writer and DJ Hiroshi Egaitsu will be one of our guest speakers as an expert on Japanese street culture. A graduate of Kyoto Seika University and part-time lecturer at Rikkyo University, Egaitsu was also the Program Director of Pompidou Centre’s first Kyoto showing of their renowned film festival, “Hors Pistes.” Since the early 90s, Egaitsu has been a resident DJ at some of Tokyo’s founding clubs, including P.Picasso, Zoo, Mix, Yellow, and Inkstick. 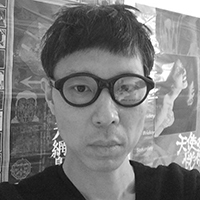 He has been active in the street culture scene both in Japan and abroad and was a co-translator for the book “Sound Art”. Currently, he is working on writing about the Japanese rap scene for his upcoming book “Tokyo・Bronx・Hip-Hop,” which is tentatively scheduled to be published next spring. Born in 1976 in Osaka, Takumi Kaseno began working with Takashi Murakami in 1999 as part of his original studio team. He now works at Kaikai Kiki as the head of GEISAI∞infinity. With home quarters in Kaikai Kiki’s Nakano Broadway gallery, Zingaro, the GEISAI project aims to support Japanese graffiti and street artists while also reaching out to international artists.